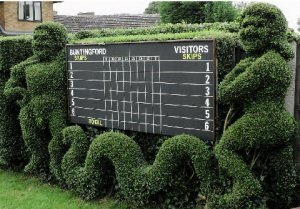 Buntingford Bowls Club was founded early in the 20th Century - the actual date is unknown, however it is known that the club existed in1914. It is believed that Bowling Green Lane in Buntingford became the club's very first home with the first house off Bowlers Mead aptly named as 'Greenkeeper's Cottage'. To this day the name still remains. It is then widely known that in 1922 two rinks were formed in Layston Cottage, River Green in Buntingford. It moved to its present site in Wyddial Road in 1926.